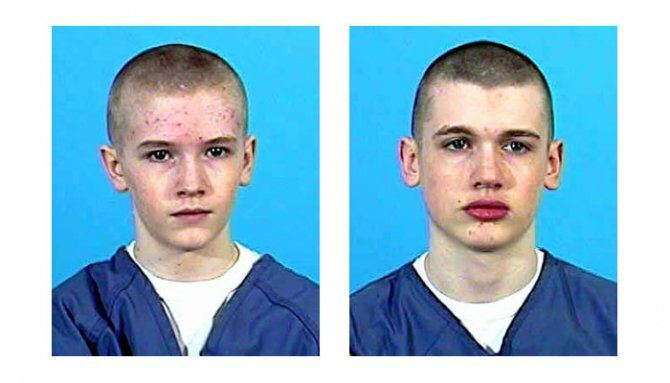 Florida brothers Alex (left) and Derek King pleaded guilty in November 2002 to killing their father with a baseball bat and then setting their house on fire. Alex, 13, will serve seven years in prison while his 14-year-old brother received eight years for third-degree murder and arson. Submitted by Thefather on Sat, 2011-06-11 15:39. Alex King Released from Prison. He was released on Wednesday morning, April 9, 2008 at 9:45 a.m. after serving six years for his part in his father’s death.Derek was released released in May 2009. Submitted by boofer6970 on Sun, 2011-05-15 16:27. Submitted by lisasmurf82 on Tue, 2011-03-29 15:16. Submitted by franktherabbit on Mon, 2010-11-29 13:55. Submitted by firestorm304 on Thu, 2010-11-11 18:31. So did they say why they did it was there dad mean to them...or are they just spoiled brats? Submitted by ejodee on Fri, 2010-12-31 08:47.
maybe their father was a vicious evil b**tard. Ever think of that? Submitted by snowflake on Wed, 2010-12-15 20:56. Submitted by lisasmurf on Sat, 2010-10-09 19:10. Submitted by truthbetold on Wed, 2010-09-01 03:58. I guess these little murders are free now! !